Milutin Milankovitch formulated a comprehensive mathematical model that calculated latitudinal differences in solar radiation upon the Earth's surface and the corresponding surface temperatures for 600,000 years prior to the year 1800. 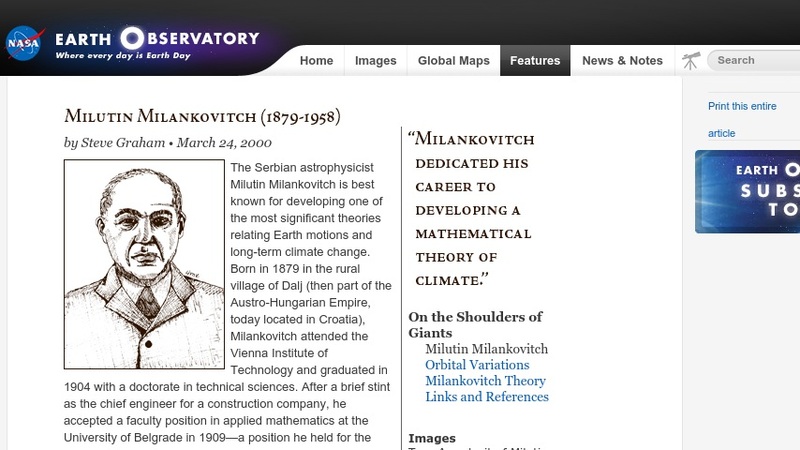 Readers can learn how Milankovitch developed his theories and how they were confirmed years later by climatic data found in deep-sea sediment cores, which indicated that major variations in climate such as ice ages were closely associated with changes in the geometry of Earth's orbit. This is part of NASA's Earth Observatory series of publications entitled "On the Shoulders of Giants," which are about scientists who revolutionized our understanding of the atmosphere, oceans, climate, and environment.